I think these zombie cake pops are way to cute to pass up this Halloween. It might be because four years ago when I made my first ever batch of cake pops, half of them looked like this. To bad we were trying to make Easter cake pops! 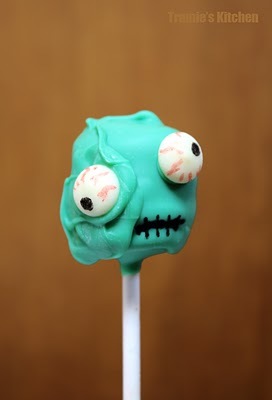 You can check out how to make these fun Halloween zombie cake pops over at Trammie's Kitchen. I was just thinking...half of mine look like this each time! lol... so this is definitely a good project for all of us!